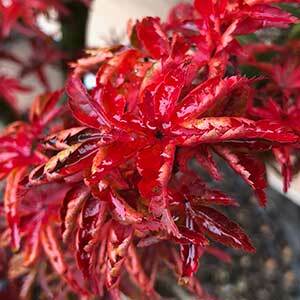 Sometimes called the Lions Head Maple, Acer Palmatum Shishigashira is a small tree with a compact upright habit. Small foliage that forms in dense clumps make this an interesting feature tree for small gardens. With an attractive vase shape and the ability to take more sun than some other varieties without as much leaf burn, the Shishigashira maple is an excellent choice. This is a variety that grows with distinct clumps or tufts of foliage, deep green leaves are small, with undulating leaf margins giving it a wrinkled look. It is when the leaves turn to red that the glossy nature is highlighted, especially when wet. This is an easy care maple, best in a humus rich soil with some moisture through the summer. Although it does like protection from hot drying winds, autumn colour is best with good light. With the small foliage and naturally slow growth this is an ideal specimen for bonsai. The very tight foliage, clumped and slightly crinkled gives the tree a natural ‘bonsai’ look. It does look good as a small feature tree in a lawn or in the garden border. 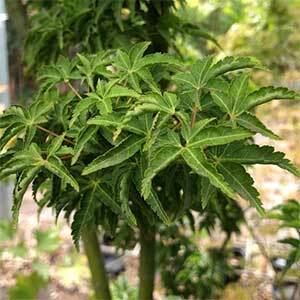 Over time the tree will reach 3 metres in heigh, it is slow growing so is well suited to growing in containers. Spread – Will spread to around 3metres. Foliage – Mid to deep green. Flowers – Insignificant, small samaras in spring to summer. Drought tolerant – No, best in moist soils. Quality grafted Japanese Maples. Largest range in Australia. Supplying Landscapers and Retail Nurseries. Strictly Wholesale. All states except WA. Monbulk – Silvan Rd. Monbulk.